The score for the Dead Cat Bounce has finally been completed. 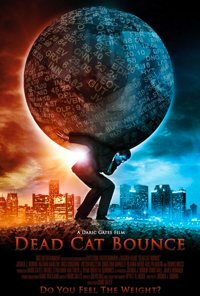 Dead Cat is a financial thriller telling the story of a Wall Street broker who discovers the secret code to the stock market, and goes head to head with an underground society that’s been controlling the world market since the fall of Rome. Scoring Dead Cat was a long process, but a lot of fun. I drew a lot of inspiration from Sean Callery’s work scoring the television series 24, but with a lot of other influences drawn in too, including Thomas Newman’s uniquely flavored score to Erin Brockovich. The opening credits of Dead Cat, which contain some of my favorite music written for this movie, starts from a single note, which begins to diverge with weirdly echoing guitars, winds, and percussive taps until it explodes into a chase scene that opens the movie and sets the tone. In addition to scoring the film, I also did a substantial portion of the sound design work on it. Little details like the sounds of coins dropping (featured in the opening credits) are, to me, some of the most interesting ways to blur the line between score and sound design. I got this idea from John Ottman‘s amazing work on 2008’s Valkryie, in which he did both the scoring and the sound design, and I thought he did an amazing job at both, and I loved how both the score and the sound design supported the movie in a way that, perhaps, two separate people doing the two jobs might not have thought to work together. There are several moments throughout Dead Cat that I implemented ideas like this. The trailer for Dead Cat can be viewed here (though I did not score the trailer), and the full movie can be watched at OpenFilm.com.